A trove of jazz recorded in the 1950s became available again when Naxos of America acquired the Bethlehem Records catalogue a couple of years ago and began an extensive reissue program. Gus Wildi, who was born and grew up in Switzerland, founded the label in New York in 1953. Through the 1950s he recorded Dexter Gordon, Booker Ervin, Zoot Sims, Mel Tormé, Oscar Pettiford, Nina Simone, Chris Connor and a couple of dozen other major artists on both coasts. He provided outlets for substantial but little-known singers like Peggy Connelly, Betty Blake and Pat Moran. Bethlehem remained important to jazz through the 1950s and into the 1960s, when it came under new ownership and began edging into Rhythm & Blues and gospel. Some Bethlehem jazz recordings have shown up in recent years on labels that may or may not have had legal reissue permission. Others all but disappeared. Among those revived by Naxos is a 1956 session that brought together Rosolino, pianist Sonny Clark, bassist Wilfred Middlebrooks and drummer Stan Levey,all musicians who earned greater recognition than they receive these days. During his years as a mainstay of the Stan Kenton band, then as a freelance jazz and studio artist, Rosolino (1926-1978) became a trombone soloist admired on a level with J.J. Johnson, Jack Teagarden, Kai Winding and Bill Harris. His facility, harmonic imagination, daring and humor have inspired legions of younger trombonists, among them the contemporary players Andy Martin, Scott Whitfield, Wycliffe Gordon and Bill Watrous. I Play Trombone includes one of the earliest covers of Sonny Rollins’s “Doxy,” introduced less than two years earlier on a Miles Davis recording. Levey recalled, “Frank loved to play that tune.” Alternating intricate fast passages with langorous extended notes, Rosolino discloses bebop inventiveness as well as the blues and soul feeling he absorbed in his youth in Detroit. The lightness, speed and mastery of harmony in Clark’s soloing on “Doxy” are typical of the work he was doing during the mid-fifties with Rosolino, the Buddy DeFranco quartet and the Lighthouse All-Stars. Rosolino blazes through a fast blues called “My Delux.” Muted, he relaxes with “The Things We Did Last Summer.” For Rosolino, however, relaxation was incomplete without digressing into a rapid-fire arpeggio or two. This session is a gem of his discography. All of his career, Mingus sought combinations of instruments, forms and musical textures that would satisfy the demands of his protean nature. As he grew older, his eclecticism kept pace with the development of his skill as a bassist, composer and leader, producing such milestone recordings as Mingus Ah-Um and The Black Saint and the Sinner Lady. In this 1954 sextet session, we hear him on the way to those heights. It stands as one of the most engaging of his relatively early achievements. Except for the inclusion of Jackson Wiley’s cello on some pieces, the instrumentation is standard for bebop and post-bop small bandsa rhythm section and three horns. Not just any three horns, however; this was the recording debut of trumpeter Thad Jones, and the band included saxophonists John LaPorta and Teo Macero. Macero, also a composer, went on to a primary career as a producer. From the 1960s, that kept his highly individual tenor sax mostly under wraps. LaPorta’s clarinet and saxophone playing got considerable exposure during his Woody Herman days. In this album, his alto sax is a primary factor in solos and in the ensembles. LaPorta’s arrangement of “Stormy Weather” gives Jones a showcase for his technique and the expressiveness of his ballad playing. Dizzy Gillespie’s example is plain in Jones’s work on Mingus’s arrangement of “What Is This Thing Called Love,” but throughout the album it is clear that an important new trumpet soloist has emerged. As bassist, pianist, composer and arranger, Mingus coalesces the human and musical elements into six tracks that are extensions of his personality. That is true throughout, but particularly on his “Minor Intrusion,” in which the written and improvised sections blend in and out of one another and the soloists are in conversation or, as Mingus suggests in his liner notes, occasional arguments. Oddly, the Bethlehem reissue of this album, originally on the Period label, eliminates the Macero composition “Abstractions.” The piece is included in this earlier reissue on Original Jazz Classics. For a complete Bethlehem discography, go here. Of all the trombone players at that time, the one who was closest to Frank Rosolino’s style and dexterity was Carl Fontana. My favorite recording they made together was Trombone Heaven recorded in Vancouver in ’78. These artists were born to play together and it was easy to see they were having fun. The notey technicality of Rosolino and Fontana reveals a side of jazz often forgotten, its kinship to brass bands. I think of Bebop meeting Herbert L. Clark. Another odd image comes to mind. 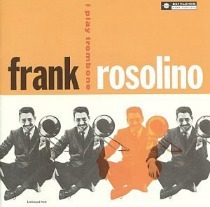 Rosolino and Fontana glowed during the final collapse of the big band era, like those flaring lights surrounding a comet as it disintegrates in the atmosphere of a desert planet. Desert or not, their legacy remains. The International Trombone Association offers a yearly award in Rosolino’s name to promising young jazz trombonists. There is a CD called Bill Evans:The Complete Gus Wildi Sessions. It’s every Bethlehem recording with Bill, including the complete Mingus EAST COASTING and outtakes, and a Jimmy Knepper session with Evans and Gene Quill. Both great albums. 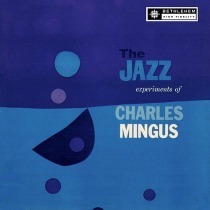 Some of the Mingus is, I think, indispensable. But the real jewel of the album is the rare 1959 recording by singer Frank Minion, who hired Miles Davis’ KIND OF BLUE rhythm section of Bill Evans, Paul Chambers, and Jimmy Cobb. Besides “Round Midnight,” they also do “So What” and “All Blues”(mislabeled as “Flamenco Sketches”), with Minion singing the Miles parts very well. The rhythm section and new Bill Evans solos and comping on the material are something I don’t think you will ever forget. I am so thankful I have that recording, and I hope it is a non-bootleg. There is a Japanese CD of it, and a Spanish version on label called Blue Sounds. There is much wonderful music on Bethlehem. One of my favorite big band sessions is the one that produced “Something Else” by an all star band led by Johnny Richards that included Maynard, Shorty, Pete Candoli, Buddy Childers, Rosolino, Kamuca, Holman, Paich, and Stan Levey. Somehow it never made it onto the Mosaic Richards set. It’s one of half dozen or so LPs I’ve taken the time to transfer to CD. And there’s Porgy and Bess, with Torme, Betty Roche, Francis Faye, Johnny Hartman, Dorough, Rosolino, and Duke’s band, all of whom were Bethlehem artists for a minute.